Reed's largely improvised monologue In Blue In The Face, where he plugs his invention for flip-lens reading glasses, brings to light his rarely seen good-humoured side. It seems that Reed has neatly folded away the ubiquitous shades, let his hair grow, come out of a depressive state of bereavement that snowballed into his last two albums, Songs for Drella and Magic And Loss to rediscover his quick-witted, charmingly effusive other self. It's a welcome return and nowhere is it more apparent than in his new album Set the Twilight Reeling, which recoils with provocative, exciting guitars, distortion, a sense of urgency and intimacy. There's an elliptical, momentarily time-warped crescendo at the end of the title track which leaves you realising that time has weathered the legendary Lou Reed far more favourably than it might appear from his pruned exterior. "Egg Cream", taken from the album, is also part of the soundtrack for Smoke, and refers to "when I was a young man, no bigger than this, a chocolate egg cream was not to be missed". Set in a cigar shop in contemporary Brooklyn, Smoke is based on "Auggie Wren's Christmas Story" by Paul Auster, which he originally wrote for The New York Times. Auggie Wren, played by Harvey Keitel, is the central character and his cigar shop is the central location, in and out of which spins an unpredictable web of crossed paths; most importantly the relationship between novelist and cigar shop regular Paul Benjamin (William Hurt), whose life is saved by on-the-run Rashid (first time actor Harold Perrineau). Keitel's absorbingly natural, almost second- nature acting seals Auster's script for Smoke as finely as a Cuban hand-rolled. Both films were directed by Wayne Wang (The Joy Luck Cub) in collaboration with Auster, who wrote Smoke and detailed character studies for Blue In The Face. Shot in only three days, Blue In The Face is set in the same cigar shop as Smoke. It's a high-spirited celebration of everyday Brooklyn life. The largely improvised performances, based on Auster's notes, also feature an array of New York personalities and actors as diverse as Madonna, Roseanne, Jim Jarmusch, Michael j.Fox, Mira Sorvino, Jared Harris and Lily Tomlin. It's a funny, intriguing, spontaneous and quite mad hour and a half. Paul Auster is foremost a storyteller, secondly an author. His first book, New York Trilogy, a collection of three short detective stories, used simple but highly crafted narrative devices to establish the unique writing point which has followed through nearly all his books; that truth is stranger than fiction. He writes without pretence, constructing inventive and highly effective twists and turns in his stories in order to blur the lines between reality and fiction, between character identities and the identity of the reader, between what it means to be alive and why we are here. He is an acrobatically graceful and strikingly skilful writer and one of America's most important contemporary novelists. "I remember thinking that Lou was flat, not at all in good form, and that none of it would make the final cut of the film. Lou was of exactly the same opinion. We walked back to my house together for a drink after the day's work was done, and we both felt disappointed, shaking our heads and trying to shrug it off. 'Well, that's showbusiness,' we said, and then went on to talk about other things. As everyone who has seen the film now knows, show business proved us both wrong. At every Blue in the Face screening I have attended, Lou's performance provokes the most laughter and the most comments. He steals the movie." Paul Auster: When did it occur to you that music might actually be something you would spend your life doing? Were you in high school? Lou Reed: I must say, no! I mean, I had wanted to do what you do. I wanted to be a writer. A formal writer. I was writing through college. However, in high school I made a record, and I was playing all these very funny bars on Long Island. Then I went off to college: one of the arguments for that was to stay out of the draft of the Vietnam War. And in college we just had bar bands. I was in bar bands every year I was in school, which augmented my income a lot. But we were terrible. We were unspeakable; we actually had to change our name quite often. Were you writing when you were young? Paul Auster: I think I started writing when I was about nine or ten. So right around the time you found the guitar, I found the pen. Lou Reed: That's kind of interesting! Paul Auster: I loved it. When I got to be about 15 I read Crime And Punishment, the great novel, and it absolutely turned me inside out. And I think it gave me a feeling about what novels can be, and I think it was that experience that made me determined to do it myself. I said, 'This is absolutely how I am going to spend my life'. And all through high school I wrote. In fact from that point on, I wrote seriously. I mean as seriously as I write now. Much of it, for many years, was real garbage. Lou Reed: You know what is funny about that? There is a Velvet Underground compilation that is out, that should be pretty good, and on it, apparently, because I haven't listened to it, is a very, very early tape of us at the very beginning. And I've seen in print, people say, 'It's unbelievable. Their writing and sound is so derivative of other people'. And my response to that is, 'Everybody has to start somewhere'. Paul Auster: ...at Princeton, back in the '80s. I did that for about five years. Now, I always felt that the most talented kids were the ones who were turning in the worst work. If I saw a 20 year-old student able to turn out something that looked like a John Cheever story with a certain degree of power and accomplishment, I realised there was no hope for that person, because he had already limited his horizons, he wasn't pushing the boundaries, he wasn't testing himself, he wasn't trying to do something new, he was just regurgitating what he felt his elders wanted from him. And the kids that were all over the place and taking risks and blundering about; those were the ones I had hope for. You know, too much early accomplishment is not a good thing. I don't think you develop. Paul Auster: ...junior salesman of ladies' shoes and accessories. Lou Reed: Did you think, 'I've got to make a living, I've got to do something'? Paul Auster: This was a great torment for me. Lou Reed: Did you ever have a real job? Paul Auster: I've had hundreds of jobs. Paul Auster: No. I never had a real job, nothing that could be qualified as a 'career'. I just had odd jobs. Lou Reed: I was a copy-reader for two weeks. I filed; actually I had a job in high school, filing burrs off nuts that had been recently manufactured. And I remember the guy next to me was 30 years older than me saying, 'You know, there is a future in this'. And I couldn't imagine what it could be! Paul Auster: I had a lot of blue collar jobs as a kid. One of the most interesting jobs I ever had was working as a census-taker in Harlem for the 1970s census. Lou Reed: ...now, how do you get a job like that? Paul Auster: I had just graduated from college and I needed to get some work. I needed to make some money. Lou Reed: That's what your degree got you! Paul Auster: That's right. We were part of the crack crew to go out and knock on the doors of the people who hadn't sent back their forms. Lou Reed: ...did they talk to you? Paul Auster: Absolutely. In fact there was one old woman who must have been 90, maybe even close to 100 and I realise now that she is the origin of Granny Ethel in Smoke. This thought didn't occur to me until a few days ago. Paul Auster: I knock on the door and this nearly blind old woman lets me in. I tell her I'm from the census. She is very polite and the lights are out in the room because she can't see much anyway. At one point she peers out at me; we were sitting on two beds on opposite sides of a narrow room. She peers out at me and says, 'You know, if you want to turn on the light, go right ahead. I mean, I don't really need it but maybe you do'. And I said, 'Thank you'. And I pulled a string hanging from the ceiling. 'Pop', the light goes on and she squints back at me and looks very carefully and says, 'Why. You're not a black boy at all'! And it turned out that I was the first white person who had ever set foot in her house. We spent a long time together. Her parents had been slaves. Lou Reed: And she couldn't tell by your voice? Paul Auster: She said, 'Well, I thought from your voice that you weren't black,' but it just was inconceivable to her that a white person should have come into her apartment. Lou Reed: All the way up there. Paul Auster: It was amazing. Anyway, what about it? When did you think music might be something you could do professionally? Lou Reed: It's a really interesting question that you are posing. And I think in some ways I could say, 'A year and a half ago'. "I think rock keeps you young"
Lou Reed: Supporting yourself by other means. Paul Auster: Well, translation mostly. I was translating books. A job that I grew to hate. It is very grinding, poorly paid work. But I always wanted my so-called freedom. But then I became a slave to my own poverty. It was a very bad situation. Lou Reed: Yeah. I know exactly what you mean. Paul Auster: I was trapped, and finally went into a tailspin and had a very bad crisis in the late '70s. And during that time I didn't write much at all. I thought I was finished. It went on for a year or two, and then I slowly got out of it. Some things happened; I became engaged in it again. I became hungry to do it again and that's when I started writing prose. Up until then I had only been publishing poems and essays. Lou Reed: Really? See, it's very funny the timespan you are talking about because in the mid to late '70s I had a terrible crisis. And that is I found out that I had some hits! I could pass for what's called a 'rock star'! Except I had no idea what I was doing! I kind of marvel at people who, at that early age, do know what they are doing. I was like a real loose cannon. And I found out, in Australia, on a tour, that every single royalty I'd ever gotten had been stolen! And that I hadn't had taxes reported for the past five years, that I was in contempt of court, there was a warrant out, I had no money in the bank, no apartment and I had been taken for a ride by these people! And had about 15 dollars in my pocket! Paul Auster: What a comforting thought! Lou Reed: Talk about a crisis! That got me involved in a law suit that lasted about ten or so years! So I always had this threat over me that I could lose this law suit and they would put a lien on me for everything. Paul Auster: But that was an external crisis. I mean, you didn't doubt yourself as someone who wanted to keep doing what you are doing, if you could. Lou Reed: Which is what I chose to do. But it certainly made me doubt my intelligence. How could you get yourself into something like this? Paul Auster: So you made some bad mistakes. Lou Reed: Beyond belief! But so many people that I know have variations on the same awful story. Did you run into any problems like that? Paul Auster: You see, you have to understand, as a writer there is no money involved. It's really so little. All I was interested in was literally paying the rent and putting food on the table. That's all I have ever aspired to. It has only been in the last few years that I've had any cushion at all. So I've spent most of my life really being on the edge! It's not a good way to live and yet, if you believe in what you are doing, and you feel you have to do it, what choice do you have? You don't have a choice. Lou Reed: You are right! Because when you think about some of the advice you are given, like: 'Fall back on a real job with security'. What security? These people are being fired left and right, and seniority are the first people to go! Paul Auster: I also see what people look like at my age who have been working in corporate America for the last 25 years. They look 10 to 15 years older than I do! Lou Reed: Easily! I think rock keeps you young. Paul Auster: I think writing keeps you young. Any art keeps people fresh, because you never retire. You just do it until you croak! Lou Reed: You are also not having your blood and juices crushed by a job that doesn't let you express any of it! If that's the thing that gives you air! Paul Auster: ...she feels much relieved and happy, and spends money with a certain gusto, and I'm more than pleased for her to get whatever she wants. I'm the one now who is anxious, I keep thinking, 'Things are going well now, but just wait. You know, some stone is going to fall out of the sky and hit me on the head...'. Lou Reed: That's what I may have been suffering from after the induction of the Rock'n'Roll Hall Of Fame. Things are going so well that if you dare enjoy this stuff something very terrible will happen to you. But I was talking to a friend of mine, Patti Smith, because one of the guys in the group had died, sad to say, and she said, - and I thought this is a great way of looking at things - 'Because the other person can't be there, you owe it to them to enjoy yourself twice as much'. Lou Reed: And then she added a little addendum to it. 'And that is really hard'! But I thought of that and I tried to take it to heart. You can't waste that moment, it's so easy to cover yourself up. Paul Auster: ...so many people that we've loved and cared about are not here any more, but you carry them around inside you. The older you get, the more your life becomes a quiet conversation with the dead. I find that very sad and at the same time very comforting. You know, the older you get, the more of a spiritual being you become. You are living with ghosts and they have a lot to tell you. And if you listen carefully you can learn a lot. Lou Reed: Well, I find myself re-examining things that were said... it's a favourite theme in writing... always that: 'Say something now: if you wait too long, something happens and you might not get a chance to say it at all'. And it turns out to really be true. I had an incident. A friend of mine thought he had heard one of the Velvet Underground had died and he thought for some reason it was me, and I found this incredible message on my machine and I called him up, and he said: 'You're OK!'. I said: 'Yeah!'. Lou Reed: Yeah! It was very, very, touching for me. Lou Reed: ...I certainly did! But when did you... you were saying that you were getting by on almost nothing and now things are better, and in some ways it makes you even more nervous. But did you ever think, for instance, 'Maybe I should do something, a one-shot commercial thing that would really bring in some money and then I could take a breath.'? Lou Reed: You went further than I did. It was a board game. Mine was called Rock'n'Roll. And it was like a Monopoly board. The object was to get into the Top Ten. Lou Reed: But things would happen. You roll the dice, you move it ahead and it would say: You just got a recording contract. Advance. Then you advance, then you throw something, maybe pick up 'Chance'. And it says: Your bass player OD'd or Co to rehab or Co back. Your record company drops you! Lou Reed: ...don't you think it's remarkable that one of the things that occurred to both of us was 'make a game'! Paul Auster: A solution for people who don't want to work! You want to make a quick and incisive killing! Lou Reed: But it's the kind of thing that people who live on their imagination do, their idea of doing something that might make some money. We'll take what's serious and we'll make it a game! Lou Reed: Look at this, I am talking about a game called Rock'n'Roll, where all of these terrible things keep subverting what you are trying to do! Ah, it's so funny! Was the game rejected? Paul Auster: Yeah, it was rejected. It almost worked, but it didn't quite. And then I wrote a detective novel under another name. I mean, it's perfectly decent, I'm not ashamed of it, but it was done strictly for money. But the problem was, willing as I was to prostitute myself, nobody would really have me! Paul Auster: And I ultimately made 900 dollars publishing that book! 900 dollars! I wanted to sell myself! I was ready. And it didn't work. Lou Reed: Someone once said to me about one of my albums, 'This is real prostitution. Don't you feel you are selling yourself?'. And I hadn't even thought about it! And I said, 'As a matter of fact, I would have if I could have! You know, but no one would have me'. There are fans of mine, other musicians who say to me, 'How could you let someone re-record your song?' Now, one can't stop them, but above and beyond that, I'd say, 'What do you mean?' And they'd say, 'It's a degrading thing!'. Paul Auster: It's actually a compliment! Lou Reed: (Laughs loudly) Yeah! Paul Auster: It really is. If someone else wants to do something with something you have done, it's an honour. Really! Lou Reed: I'm just wondering whether you get anything like this where they don't want anything you do, for instance, to be made into a movie. Or have a synopsis made of it, or have it changed or altered for another format. Paul Auster: No, it's different. It's altogether different. Most people make compromises at one time or another, but not everyone. Think of Harvey Keitel. I mention his name because we both know him. Harvey told me not long ago that he turned down a movie offer for three million dollars. He said, 'I just couldn't see myself doing it. I hated the part, I hated the movie and I couldn't do it'. And he obviously could have used the money to great advantage. And that is the thing I like about him so much. Lou Reed: He could have made Blue In The Face with that! Paul Auster: Are you kidding? He could have made two Blue In The Face's. He's one of the few well known actors who hasn't sold out. It's not as though every movie he is in is good. But he thinks it might be good, and he goes into it with a truly good spirit. And I respect him a lot for those kinds of decisions. Lou Reed: Would you like to mention, by the way, the miracle of Blue In The Face and Smoke and how they came about? Paul Auster: Smoke started from that little Christmas story that was commissioned by The New York Times. Lou Reed: I remember reading it in the Times and loving it then! Lou Reed: Can I ask you a question? Now I get asked the same question all the time. And it's great for me to ask you. Did you really meet someone like Auggie who was taking a picture every day from that corner? Paul Auster: No, everything is made up. In fact I wrote it in the Times in such a way as to confuse everybody. I tried to blur the boundaries of what is real and what is not real and the proof that it worked was that Mike Levitas, the editor of the page had, of course, hired a photographer to do it and half the letters that came to the Times were letters of protest, saying, 'Why didn't you publish Auggie Wren's photographs, how could you rip that poor man off?'. When he doesn't exist! Anyway. So Wayne read the story and thought a film could be made on the strength of it. And for over a year I d i d n ' t participate, I didn't want anything to do with writing the screenplay. Little by little he lured me in. Paul Auster: I gave them permission because he's a good filmmaker. Lou Reed: So you said, 'If you want to pursue it, go ahead, I'm not gonna stop you', right? Paul Auster: Exactly. But Wayne led me into it and I enjoyed working with him a lot. He brought me in as a real partner. He's the only filmmaker in the history of American films, I think, who has actively courted the collaboration of a writer and has worked with him hand in glove to such a degree that finally both our names are on the film. It's an extraordinary thing. Lou Reed: '30th Smash Week!' I remember passing that and saying, 'That must be a very pleasurable thing to see'. Paul Auster: It was very nice; we didn't expect anything like that to happen. Blue In the Face was born during rehearsals for Smoke. Harvey was there with Giancarlo Esposito and they said, 'Can we improvise just to warm up?' And of course they could and what they did was so funny and interesting that Wayne, in one of his bursts of enthusiasm turned to me and said, 'Why don't we make another movie when we're done with Smoke?' So we started working on that too. That's when you and I spoke. And why did I call you? Simply because we had become friends and I liked you very much and I admired your work and I thought there's something about your voice that's going to work in this film, because it's a New York voice. We didn't have any plan; as you know, we were winging it, and it worked. I'm glad we did it, it was a very nutty project. Six days to shoot and ten months to edit. But back to you, Lou, there's something else I wanted to ask you. As you keep making music, do you feel that it gets easier or harder? That you've learned anything or are you constantly having to teach yourself all over again? Lou Reed: I have to teach myself all over again but it's much quicker, because I've done it before and I remember, and I remember fairly fast. Paul Auster: You get to your mark faster. Lou Reed: Absolutely. I have learned some things not to do, and I'm careful not to do them. Paul Auster: I find that it gets harder, that I get stupider as I get older and have to keep relearning or teaching myself all over again. The only thing that experience has helped me with is not to get too depressed when it's not going well. That's a very big improvement because when I was younger and got stuck, which writers do all the time, you run into dead ends and go down the wrong path, I would get desperate. I rarely could work my way out of the problem. Now, I run into that wall and I say, 'Alright, time to stop, just leave it alone, just walk away and come back in two or three days. Maybe even a night's sleep is all you need'. Lou Reed: That's the thing. If experience only taught you that, you'd be miles ahead of the younger you. Paul Auster: I am in that respect. Lou Reed: I think of it as a trick. If you're sat there and saying, 'Oh my God, it's gone, it's this, it's that, I'm finished, oh, da-da, da-da, da-da', but in fact you say 'You know, I'm gonna go get a pizza...'. Lou Reed: ...maybe watch the Nicks, 'We'll come back to this and not be worried'. It's the lack of worry, everything will be okay. It's a natural ebb and flow taking place. I think it's the single most important thing I've known. And there's one other thing I've learned and that is, when the flow is going, stay out of the way. Don't get hung up on a word or singular detail, or you'll stop it. Paul Auster: Yeah, just keep pushing ahead. Lou Reed: Keep going in a straight line. You can always come back, but if you intrude you can do something that can derail everything and then you will go into that panic state of 'uh-oh'. Paul Auster: OK: last question, because this is something that I don't do and I can't share with you. After all these years, does performing still thrill you? 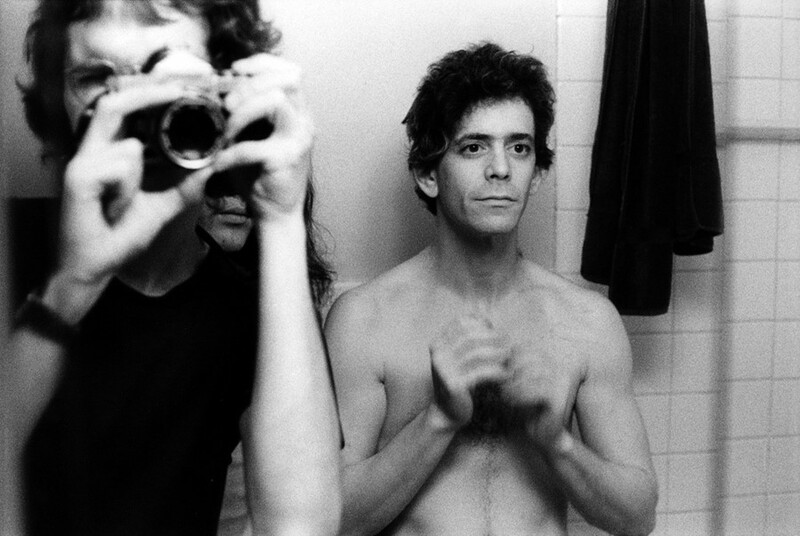 Lou Reed: When I haven't done it in a while, I can't even imagine how you do it. That's also true though, for me, regarding writing. If I haven't written anything for a while, I can look at the lyrics and I can't even imagine who wrote it. It's very, very strange and I really wish that didn't happen. I really wish that I looked and said, 'I know exactly how I did that, I know how to get it back', but it's not true. With performing, I know that I really like playing with the guys and I know the show can be an enormous amount of fun. It's just at this particular stage of the game I can't for the life of me figure out, 'Who does that?'. Paul Auster: It's like contemplating swimming. It's a chilly day and plunging into the water seems like the most unappetising thing. Then you're in the water and it feels good. Lou Reed: I know that I do it, I know I get off on it. It's like one of those things you were saying about trying to teach yourself to remember. It must be something like that. But I'm gonna be remembering real soon. But every time I do it I really love it, there's nothing like the exhilaration of a live show. Paul Auster: I've given many readings, but it's not quite the same thing. You're just reading your book, you're not really 'performing' it. Lou Reed: Well, reading is performing, isn't it? Paul Auster: In a more subtle way, perhaps, it's much more subdued. Although I must say, my friend Art Spiegelman and I read at Summer Stage in Central Park last July. Lou Reed: I did that. Paul Auster: On this big rock'n'roll stage with 5,000 people in the audience and that was a new kind of reading for me. Mosquitos flying in your face, helicopters whirring overhead. Lou Reed: Don't you think there's acting involved? Don't you think it's a performance? Paul Auster: Definitely. But it's not as though... it's just something I do every now and again. Lou Reed: Don't you think of putting some music on the back of it? Paul Auster: (Laughing) No. We can try that sometime. Lou Reed: Like jazz. Like those old '50s guys used to do. Lou Reed: This is a good place to stop. Paul Auster: I think so. Lou Reed: The melding of word and music. Paul Auster: We're all on the stage here.